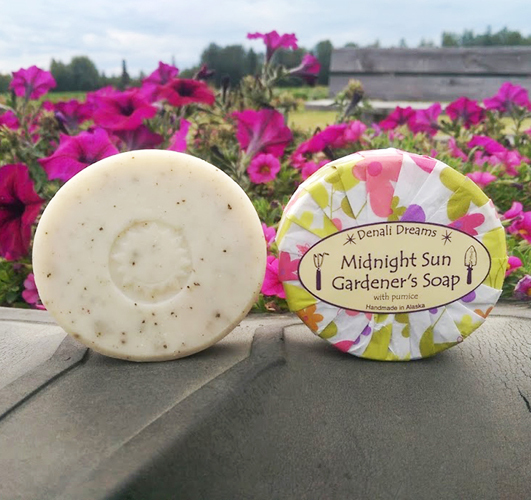 The Midnight Gardener’s Soap named after the midnight sun that allows Alaskans to cultivate long into the night. This soap contains finely ground pumice to scrub away dirt & grit from the garden. Scented with the healing essential oils of rosemary, lemongrass, and peppermint. Amazing soap that strips away all the dirt and grime from a good day’s work in the gardens. Also wonderful in the shower — but not for tender little children’s skin….it’s like a spa exfoliating treatment! Pure heaven!! !